Tracy sent me the wonderfully encouraging story of her son Charlie. I love this picture taken of him at school. This is my youngest boy Charlie who is now 3 years old. 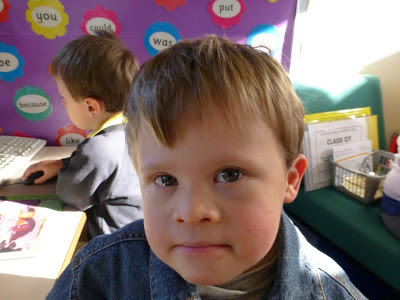 He is going to a special needs school and a mainstream pre school, both of which he loves. He has two older brothers who really look after him and adore him. We are so proud of his little achievements, some many will think small but to us they are all big!! He is a happy smiley little thing, who knows his own mind (stubborn like his parents), but he brings joy to all that meet and know him. We cannot imagine life without him.